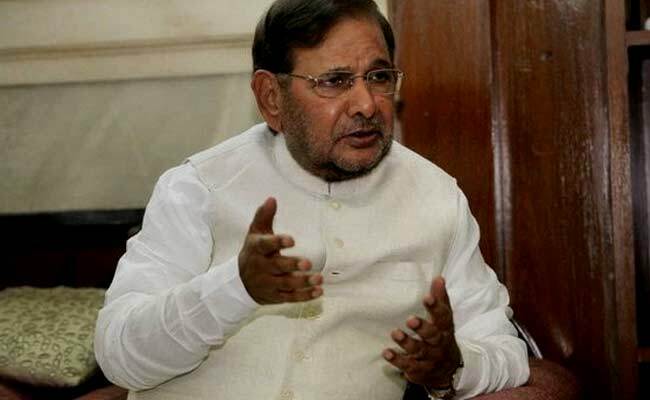 Janata Dal United leader Sharad Yadav today met Congress president Sonia Gandhi amid talk of a joint presidential candidate being put up by the opposition. Ms Gandhi, who has emerged as the central force in uniting various parties on the issue, spent some time discussing the current political situation. New Delhi: Senior Janata Dal United leader Sharad Yadav today met Congress president Sonia Gandhi amid talk of a joint presidential candidate being put up by the opposition. Ms Gandhi, who has emerged as the central force in uniting various parties on the issue, spent some time discussing the current political situation. However, Mr Yadav, whose name is among one of the probable candidates, termed the meeting as a mere "courtesy call". "It was merely a courtesy call," he told PTI. Hectic negotiations are on among opposition parties for putting up a joint presidential candidate to replace incumbent President Pranab Mukherjee. Ms Gandhi has met several opposition leaders, including Bihar chief minister Nitish Kumar and Left leaders Sitaram Yechury and D Raja, in the recent past over the issue. Sources said the opposition is trying to put up a united face and jointly fight the presidential poll even though the numbers have tilted in favour of the NDA after Uttar Pradesh assembly election results. Parleys are also being held among leaders of other opposition parties. The presidential election has to be held before July 24, when President Pranab Mukherjee's term ends. He had taken over the post in July 2012, defeating the NDA candidate late P A Sangma. Sources said that during his meeting with Ms Gandhi yesterday there was agreement to the possibility of fielding a candidate acceptable to all secular opposition parties, but there is no discussion on likely candidates yet. When asked, Congress spokesperson Manish Tewari said no names have been discussed so far. "We are aware of the consultations, which are evolving consultations. We will get back to you whenever something is finalised," he said. The Congress would take a "conscious, concerted and balanced call" on a joint opposition presidential candidate after consultation with all opposition leaders. The sudden flurry of opposition activities comes in the wake of the BJP's winning streak in states since the formation of the Narendra Modi government in 2014. It currently has governments in 13 states and is a junior partner in the ruling alliance in Jammu and Kashmir and Andhra Pradesh. Some feel that the opposition unity for contesting may well turn out to be a precursor to an anti-NDA front ahead of the 2019 Lok Sabha election.